Hurricane Sandy has changed the national conversation on climate change. Unlike Hurricane Katrina, which much of the country was happy to pin the blame for on New Orleans itself (“they shouldn’t have built there in the first place!”), Sandy revealed climate change to be a growing threat to nearly all coastal settlements. Formerly abstract warnings of growing inundation risk, stemming from rising sea levels and increasing storm frequency, suddenly became concrete and impossible to ignore. A new found sense of vulnerability descended on coastal cities. In this light, urban design cannot be dismissed as merely a luxury or an aesthetic consideration. The discipline has taken on a new relevance and sense of urgency: cities, particularly in coastal settings, must reconsider their built form in order to adapt to radically altered environmental conditions. Three new books by Island Press approach these issues with renewed sense of the value of the urban design. 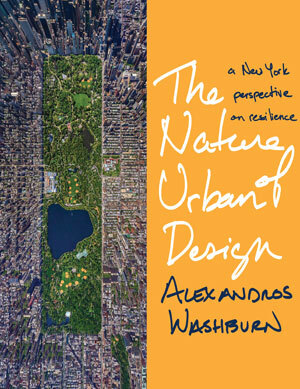 Entertaining and attractively designed, Alexandros Washburn’s The Nature of Urban Design: A New York Perspective on Resilience provides a fantastic introduction to the discipline of urban design for non-designers. Washburn, the chief urban designer for New York City, uses that city as a case study to explain what exactly urban designers do and why it matters. He broadly defines urban design as “the art of changing cities, guiding growth to follow new patterns that better meet our challenges while improving our quality of life.” Of course, perhaps the biggest challenge facing cities today is climate change, and The Nature of Urban Design uses Hurricane Sandy to illustrate the need for adaptation, and how urban design can act as an agent of change. He methodically walks us through why urban design matters, how urban designers work, how urban design can be a catalyst for transformation (using the High Line as a case study), and how it can lead to resilience in the face of climate change. He discusses two strategies for resilience: mitigation and adaptation. Mitigation means reducing greenhouse gases in order to prevent adverse climate change, while adaptation involves reducing vulnerability to projected climate change. With a certain degree of environmental change now inevitable and a dramatic, global reduction in greenhouse gas production seeming less and less likely, Washburn’s approach to resiliency is both idealistic and practical. 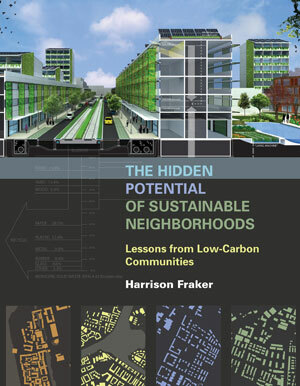 Like Washburn’s book, The Hidden Potential of Sustainable Neighborhoods: Lessons from Low-Carbon Communities, by Harrison Fraker, uses global climate change to frame the new importance of urban design. Unlike Washburn’s broad overview of the profession, however, Fraker’s is more narrowly focused, using four European case studies to dig into the specifics of several low-carbon urban design projects. Fraker describes how sustainability issues such as energy efficiency have historically only been considered on the building scale. The neighborhood scale, however, represents new opportunities for carbon reduction. Fraker argues that the neighborhood scale has the “potential to integrate the design of transportation, buildings, and infrastructure while engaging the design of the public realm as part of the system.” He refers to this as a “whole-systems approach,” where all urban systems are considered together, greatly expanding the potential for resiliency. The Hidden Potential of Sustainable Neighborhoods is about mitigation, citing examples of low-carbon urban design projects. This does not mean, however, that Fraker is merely presenting a series of utopian designs. Each of the examples in the book is actually built, and Fraker looks back at commonalities between each project’s implementation and subsequent performance. Furthermore, he applies the lessons learned from the four European examples to sprawling, patchwork American urbanism, describing the potential for infill opportunities. Fraker could have spent more time addressing how to retrofit existing development rather than concentrating on new development. Still, as he states, new models can catalyze paradigm shifts, and we should appreciate his effort to translate European lessons to messy American cities. If The Nature of Urban Design is a layperson’s introduction to urban design, and The Hidden Potential of Sustainable Neighborhoods is a case-study resource for urban designers, The Guide to Greening Cities, by Sadhu Aufochs Johnston, Steven S. Nicholas, and Julia Parzen, is probably of most interest to urban planners. Like the other two books, The Guide to Greening Cities lays out the challenge of designing cities in the face of climate change. Johnston and his co-authors also refer to Hurricane Sandy, as well as other climactic events, to establish the new urgency of resilient city design. Instead of studying the design of resilient cities, however, Greening Cities explores how city leaders can implement new sustainability projects. Johnston and team state that the book is “written from the perspective of green city leaders and champions who are working inside city governments in North America and who have succeeded in pushing forward innovative green projects.” Rather than emphasizing the design of sustainability, Greening Cities walks through how city leaders can make a case for, fund, implement, and subsequently monitor green projects. 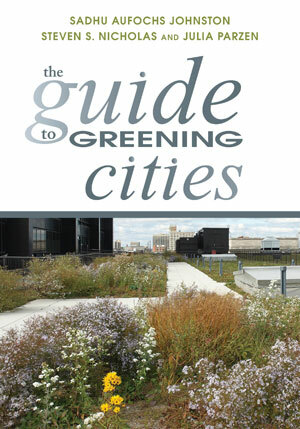 In this way, The Guide to Greening Cities is a useful book for urban planners wishing to increase the resiliency of their communities. Cities are now faced with the task of both adapting to inevitably changing environmental conditions and minimizing their contributions to future climate change. The political, economic, environmental, and technological challenges associated with this task are bewilderingly complex. However, recent events such as Hurricane Sandy have shown inaction to be an increasingly tragic prospect. The complexity of designing for urban resilience requires a broad cultural shift across many different disciplines. These three books address the same problem of designing in the face of global climate change, but do so for different audiences – the general public, urban designers, and urban planners. With the consequences of global warming no longer abstract, hopefully the sense of urgency that inspired these books will not abate. I think transportation will be a big component of this type of development as these designs begin to evolve. Just look at the project in the UK http://inhabitat.com/100-self-driving-ultra-personal-electric-transportation-pods-to-be-installed-near-london/ coupled ideas from up and coming designers I think we are going to great solutions. It’s very exciting. Reblogged this on Urban Choreography.